Magazine for the professional limousine, charter and tour industry. 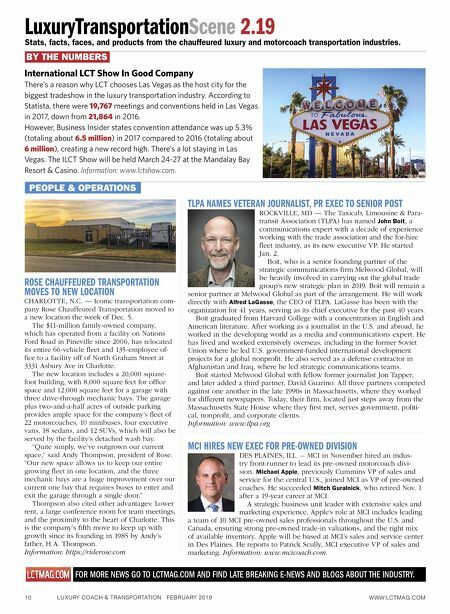 10 LUXURY COACH & TRANSPORTATION FEBRUARY 2019 WWW.LCTMAG.COM PEOPLE & OPERATIONS Stats, facts, faces, and products from the chauffeured luxury and motorcoach transportation industries. LuxuryTransportation Scene 2.19 BY THE NUMBERS FOR MORE NEWS GO TO LCTMAG.COM AND FIND LATE BREAKING E-NEWS AND BLOGS ABOUT THE INDUSTRY. International LCT Show In Good Company There's a reason why LCT chooses Las Vegas as the host city for the biggest tradeshow in the luxury transportation industry. According to Statista, there were 19,767 meetings and conventions held in Las Vegas in 2017, down from 21,864 in 2016. However, Business Insider states convention attendance was up 5.3% (totaling about 6.5 million ) in 2017 compared to 2016 (totaling about 6 million ), creating a new record high. There's a lot staying in Las Vegas. The ILCT Show will be held March 24-27 at the Mandalay Bay Resort & Casino. Information: www.lctshow.com. ROSE CHAUFFEURED TRANSPORTATION MOVES TO NEW LOCATION CHARLOTTE, N.C. — Iconic transportation com- pany Rose Chauffeured Transportation moved to a n ew location the week of Dec. 5. The $11-million family-owned company, which has operated from a facility on Nations Ford Road in Pineville since 2006, has relocated its entire 66-vehicle fleet and 135-employee of- fice to a facility off of North Graham Street at 3331 Asbury Ave in Charlotte. The new location includes a 20,000 square- foot building, with 8,000 square feet for office space and 12,000 square feet for a garage with three drive-through mechanic bays. The garage plus two-and-a-half acres of outside parking provides ample space for the company's fleet of 22 motorcoaches, 10 minibuses, four executive vans, 18 sedans, and 12 SUVs, which will also be served by the facility's detached wash bay. "Quite simply, we've outgrown our current space," said Andy Thompson, president of Rose. "Our new space allows us to keep our entire growing fleet in one location, and the three mechanic bays are a huge improvement over our current one bay that requires buses to enter and exit the garage through a single door." Thompson also cited other advantages: Lower rent, a large conference room for team meetings, and the proximity to the heart of Charlotte. This is the company's fifth move to keep up with growth since its founding in 1985 by Andy's father, H.A. Thompson. Information: https://riderose.com TLPA NAMES VETERAN JOURNALIST, PR EXEC TO SENIOR POST RO CKVILLE, MD — The T axicab, Limousine & Para- transit Association (TLPA) has named John Boit, a communications expert with a decade of experience working with the trade association and the for-hire fleet industry, as its new executive VP. He started Jan. 2. Boit, who is a senior founding partner of the strategic communications firm Melwood Global, will be heavily involved in carrying out the global trade group's new strategic plan in 2019. Boit will remain a senior partner at Melwood Global as part of the arrangement. He will work directly with Alfred LaGasse, the CEO of TLPA. LaGasse has been with the organization for 41 years, serving as its chief executive for the past 40 years. Boit graduated from Harvard College with a concentration in English and American literature. After working as a journalist in the U.S. and abroad, he worked in the developing world as a media and communications expert. He has lived and worked extensively overseas, including in the former Soviet Union where he led U.S. government-funded international development projects for a global nonprofit. He also served as a defense contractor in Afghanistan and Iraq, where he led strategic communications teams. Boit started Melwood Global with fellow former journalist Jon Tapper, and later added a third partner, David Guarino. All three partners competed against one another in the late 1990s in Massachusetts, where they worked for different newspapers. Today, their firm, located just steps away from the Massachusetts State House where they first met, serves government, politi- cal, nonprofit, and corporate clients. 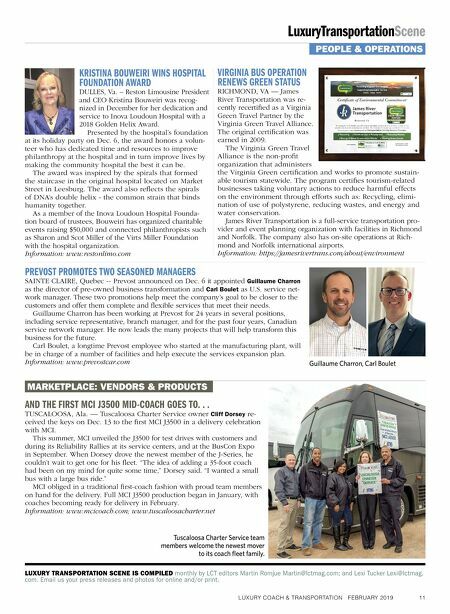 Information: www.tlpa.org MCI HIRES NEW EXEC FOR PRE-OWNED DIVISION DES PLAINES, ILL. -- MCI in November hired an indus- try front-runner to lead its pre-owned motorcoach divi- sion. Michael Apple, previously Cummins VP of sales and service for the central U.S., joined MCI as VP of pre-owned coaches. He succeeded Mitch Guralnick, who retired Nov. 1 after a 19-year career at MCI. A strategic business unit leader with extensive sales and marketing experience, Apple's role at MCI includes leading a team of 10 MCI pre-owned sales professionals throughout the U.S. and Canada, ensuring strong pre-owned trade-in valuations, and the right mix of available inventory. Apple will be based at MCI's sales and service center in Des Plaines. He reports to Patrick Scully, MCI executive VP of sales and marketing. Information: www.mcicoach.com.